See what I'm doing here? Heh. So I do not expect to have to tell many of you who Karen Russell is, but if you've been living under a rock, scoot over, because you're taking all the dry spots. No, uh, wait - I meant to say that Karen is the incredible creative force behind the Narratives collection and in her spare time she teaches amazing classes, chases four children around, takes sickeningly good photos, which she often shares on her uplifting and eye-candy blog, keeps her teeth impeccably clean, and I think she might also run marathons, feed the homeless and give blood. She's teaching an online photography course this summer and you should totally sign up for her newsletter if you're interested. The girl knows her stuff. I'm just sayin'! But hey, in my small less-organized, dingier teeth corner of the world . . . (which is really not a corner because Colorado is in the middle, yo) . . . exciting things are happening in the form of lots of orders for the new Home Construction Projects! THANK YOU! If this keeps up I won't have to call Karen Russell nearly as often, which is, now that I think about it, probably why she gave me a shout-out on her blog. Spring Break has started. It's officially next week, but they also got Thursday and Friday off because of Parent Teacher Conferences. To all the family members reading, the children are doing well at school. Karl got a perfect 100% in Spelling - didn't miss a word the entire quarter - so he continues his pattern of being extremely gifted in areas that are unlikely to earn him a nickel. Heh. Emma continues to excel in math, with everyone agreeing that she's also got a gift for writing that she hasn't quite fully discovered yet. I wish she would, because then she could update my blog! In keeping with my promise to only post on major holidays, here's a new one! And it's a day early! You're welcome. Heh. Yes, I've been TUSH (Trapped Under Something Heavy) and although I haven't completely extricated myself from the crushing weight, I've managed to free my arms, which allows me to design and post, so there's that. ME: John! Watch when Camby comes in - see how he just drops his warm-ups and that guy runs and gets them? ME: Well I don't think it's right! If the coach says you're going in, you should take off your shirt and drop it nicely on your chair. Why do they have to employ some lackey to pick up their clothes?! JOHN: Just to be clear. . . this is YOU saying this, right? YOU?! YOU are the one suggesting that nobody should have a lackey to pick up their clothes? ME: Oh look - Iverson scored again. Such a great game. You want another beer? To really understand the irony that John was referring to, you'd have to see the mountain of clothes that lives on the floor by my side of the bed. John only tolerates it because the bed blocks it from view so he can delude himself into thinking that the room is clean. HE always hangs his clothes up, the big show-off, and occasionally, when the mound is too big or visible from his side of the room, he hangs up my clothes, too. Or at least the ones that are draped over the end of the bed. And I think the lesson to be learned from all of this is that I was destined to play in the NBA! Heh. OK, onto other things. The Celebrate Life event in the Netherlands apparently went well. Thanks to the students who e-mailed to praise the project. I'm glad you enjoyed it. And now everyone gets to, because I've released Celebrate Life as a Home Construction project. And now for a BRAND NEW Home Construction project! 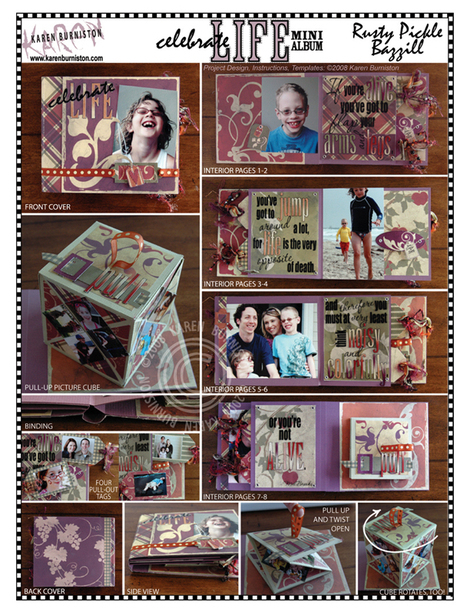 I've teamed up with my friend Jenn, who owns and runs Scrap Mountain, which is a Kit-of-the-Month club. 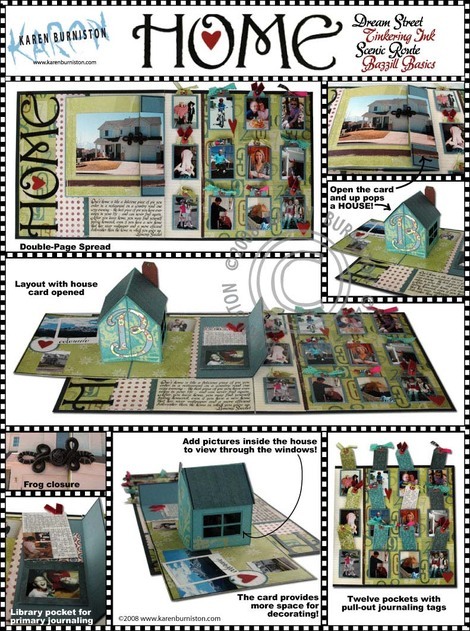 She asked me to be a guest designer for her March kit, Tinkering in the Club House, which is a cool combo of Dream Street, Tinkering Ink, Scenic Route, Bazzill, American Crafts - a whole bunch of nifty stuff. Please make sure that you've read the copyright restrictions for Home Construction projects before purchasing - these are for private, non-commercial, non-transferable use. It takes me somewhere near a century to draft the templates and create the instructions and diagrams, so please respect my copyright. by clicking on my ridiculous picture. One of the crushing weights that has been lifted is the Girl Scout Cookie sale. We're done! Emma's troop sold 3,210 boxes of cookies. Yeah. I know. It's a lot. And every single one of those boxes lived for a while in my van or garage. One last thing before I let you go to peruse Home Construction projects and hopefully buy them. I would love to team up with other Kit-of-the-Month clubs to design Home Construction projects using one of their monthly kits. If you belong to a club, or own a club, or maybe you just have a suggestion for one that might fit my particular brand of interactive shenanigans, please post a comment or e-mail me.